I so love to gossip (left). This boy is living up to his genetic potential! His Skin Follicle test results are in! He has 60 follicles per square mm with a secondary to primary follicle ratio of 18:1. 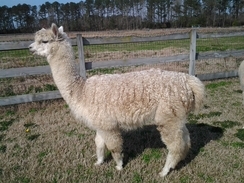 He has passed on these excellent fiber qualities to his crias as well. Julia's Starlight has been depreciated, and now you can do the same. We have a male Color Champion offspring on our herdsire row and have a female offspring as well. Add a Star(light) offspring to your herd! Lunatari was born around the full moon in December 2008 when everything seemed to glow, even at night. Her fleece has an incredible glowing brightness, hence the name Lunatari. She is conformationally correct. Her fiber forms nice tight bundles, has excellent character, density, and brilliance. Her breeder said that she almost looked like a suri cria before her first and second shearing, that's how long her fleece was. She has been a consistent award winner among tough competitors and handspinners love it, even selling before shearing! 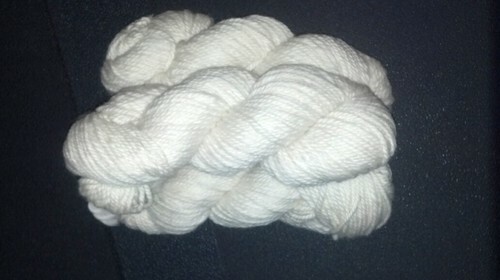 She is a beautiful alpaca and yarn made from her fleece has an impressive luster and sells easily. Her pedigree is full of well known herdsires and dams. Her dam, Julia's Starlight, has consistently produced high award winning crias, especially in white. Lunatari has NWA, LTD The Gentleman and Hemingway in her lineage. 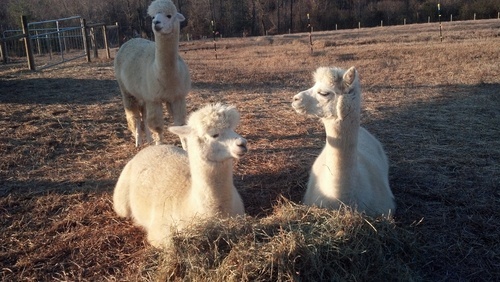 Lunatari is the second cria sired by Spruce Ridge Felix Augusto and on her sire's side, there is Maple Brook Oro's Prince, Peruvian Felix, Oro, Peruvian Augusto, and MFI Peruvian Destiny. Although her pedigree is impressive, and her fiber is gorgeous, she doesn't fit into our breeding program any longer. She is being offered at a very affordable price. Even though we have had great success with her fiber, we are now in the process of making some business changes by adding more color diversity to our herd (which is almost totally white) and is why we are selling her at such a low price. You could easily recoup her cost from the sales of roving and yarn made from her fleece.